Jeremy Sewall may have been born in upstate New York, but he’s had the heart of a true New Englander since childhood summers spent in Maine with his family, feasting on lobsters, clams and other New England specialties. The water, too, plays a large role in his lineage; fishing has been a Sewall family livelihood for generations. Today, Jeremy sources his fresh lobsters from cousin Mark Sewall, who captains his 38-foot boat out of York Harbor, Maine. Regardless of his original zip code, few embody New England more than Jeremy. He began his professional career in Maine at the Relais & Chateau White Barn Inn. Wanting to spread his wings, he moved to Europe, working for Albert Roux in London and Amsterdam before returning to Boston and a position at L’Espalier. From there, Jeremy moved to San Francisco, where he was immediately recognized for his flawless technique and passion for seafood the Lark Creek Inn in Larkspur, California. In 2000, as Executive Chef of Lark Creek Inn, Jeremy was one of five chefs in the country nominated as a Rising Star Chef by the James Beard Foundation. He moved back to the Northeast in 2003 as opening Executive Chef at Great Bay restaurant (present day Island Creek Oyster Bar), where he garnered accolades from The New York Times, Esquire and Gourmet, among others. In 2009, Jeremy’s friendship with Eastern Standard Kitchen & Drinks owner Garrett Harker led to a stint as Collaborating Chef of the heralded Kenmore Square hot spot. In 2010, they teamed up with Skip Bennett, the founder of Island Creek Oysters, to bring the Island Creek Oyster Bar to the city of Boston. In the fall of 2013, the trio opened their second restaurant, Row 34, an approachable and convivial neighborhood-focused restaurant and bar continues the team’s mission of celebrating New England’s rich seafood traditions and the farmers, fishermen, and lobstermen who inspire them. In 2015, the Row 34 team opened a second location at 5 Portwalk Place in Portsmouth, New Hampshire, just a few blocks from the bustling waterfront. In the fall of 2014, Jeremy released his first cookbook, James Beard Award nominated The New England Kitchen: Fresh Takes on Seasonal Recipes, with co-author Erin Byers Murray. In 2016, Jeremy co-authored a second book, Oysters: A Celebration in the Raw, with Marion Swaybill; the book presents a wide-ranging visual exploration of the iconic shellfish, including stunning portraits of more than fifty oyster varietals. Also in 2016, Jeremy and his partners opened a second Island Creek Oyster Bar in Burlington, MA. In the spring of 2017, Jeremy opened Les Sablons, a metropolitan restaurant located in the iconic Conductor’s Building in Cambridge’s historic Harvard Square. Through his restaurants, Jeremy is dedicated to celebrating the diversity of New England seafood and the passion of the people who bring it to us. 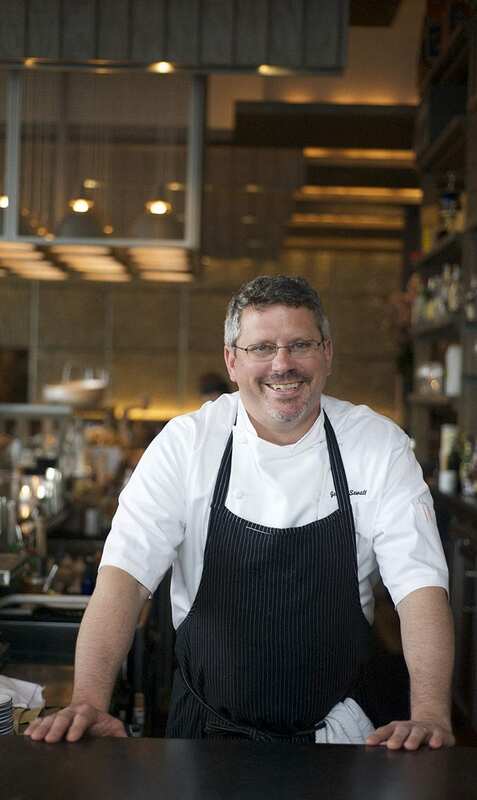 For Chef Jeremy Sewall, it’s in his blood.